You have fun writing down your ideas and want to share it with other wool lovers? You would like to sell your self created patterns and need support? Please send an email to vertrieb@rohrspatzundwollmeise.de for more information. Wollmeise makes music with designer virtuosos! We at Rohrspatz & Wollmeise see ourselves as a concert hall equipped with the instruments and scores required for excellent work. We are pleased to feature these designers who make our wool come to life through their innovative and multivocal designs, the coloratura of knitting. Why Knitting Orchestra? Because we are an ensemble in which the discipline and dedication of everyone makes art possible. Find the inspiration and confidence in our orchestra to go your own colourful ways. There is an artist in everyone. Find yours! I've tried to write as short as possible and hope I've got the most relevant information about myself. Attached is also a picture of myself. I am a Norwegian girl from Vesterålen, but currently living near Kirkenes in the top of Norway near the Russian border, with my husband. I grew up in a family where creative thinking and doing has been central. Creativity has taken place in many forms during years and my most prominent interests are photo, knitting, sewing, patchwork/qulting, weaving, drawing and architecture. I'm relatively new as a knitting designer and has therefore mainly focused on accessories like socks, mittens, hats and cowls, but is well on the way to expanding the pattern of larger garments like sweater, cardigans, skirts, shawls and poncho. It is mainly the nature that is my source of inspiration and I like to name my pattern with actual source of inspiration. I design pattern for knitting in the techniques colorwork, lace and cables. I love to combine several techniques in the same design and I love to make whole series of each design so that I can easily combine my knit design in use. I often write patterns that require a little concentration but also have thoughts about writing more simple patterns. I'm fond of decorating my pattern with drawings, but the main focus is of course writing the pattern as correctly and understandable as possible, and I try to make them tidy and clear. Since English is not my native language, I use photos for some of the techniques in the pattern to make the pattern even more understanable. My patterns are abbreviated and I'm also working to make more pictures and video tutorial that you can find on my website and/or youtube. All my paid patterns are tested by knitters from different countries. Anne Lernout is a graphic designer living in Brussels, with a passion for everything that is handmade, especially textile- and yarn related. Little notes, folded pieces of paper to check out a construction and - of course – lots and lots of yarn are scattered over her desk. She turns things upside down or inside out always questioning: why do it like this ? Why not the opposite way ? Top down, sideways, or both ? That is how a crazy idea grows into a design. A cardigan that starts with only 9 stitches at the shoulder top, stripes that go crazy or a folded forward shoulder line, all her creations have an unexpected and quirky element that makes them unique. Mostly seamless often top down, her patterns are very detailed with lots of illustrations on used techniques, schematics and diagrams. Åsa Söderman is a Swedish knitter who lives in Germany with her Danish husband, where she knits, reads, and bakes with abandon. Åsa designs things she likes to wear, things that are missing in her closet, things begging to be invented. Her style is simple with great attention to the telling or funky detail and sometimes a slightly mad construction. She likes to think of her work as well crafted in the Scandinavian design tradition. Clever solutions to tricky knitting problems please her, and she is very fond of seamless and top down. Expect the unexpected as you begin an Åsa Tricosa shawl or work your way from one shoulder to the other in a Ziggurat sweater. She also likes to share her moves, so you’ll find many photo tutorials and there is always step by step guidance in her patterns. The seamless top down Ziggurat method is her signature technique. It has evolved over several years, and it keeps evolving. For that is what is so exciting about knitting. There’s always something new to discover or invent and make. Cast on and play! My name is Julia-Maria, I am in my mid-thirties and I live in Cologne with my husband and son. I never knew boredom. Even as a small child, I always had to keep my hands busy and made handicrafts or crochet blankets for my dolls. Only at the end of 2013, the knitting came up and since then I'm burning for it. As Feinmotorik, I also write about it in my blog and report on the knitting world. I love bright colors in combination with discreet and clear designs, which in the end make a chic, wearable project. We are very happy about the cooperation with her. Jana Huck knits and lives in Lübeck on the Baltic Sea. She experiments a lot with needles and wool. What happens in this way is documented in the form of knit patterns. In this way, the entire knitting world has something of it, is the philosophy behind it. Each guide is a collaborative product involving a lecturer, a copywriter and often a model. All samples are then tested by various knitters before publication to ensure that the information is easy to understand for both beginners and advanced users. Towels, caps, tops and blankets inspired by the Dutch graphic artist M. C. Escher can be found in Jana's portfolio. Her approach is to try something new as often as possible. 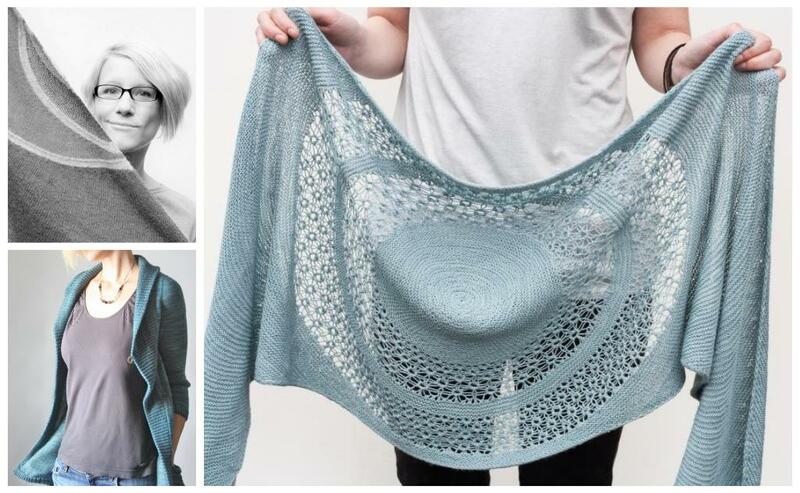 So her designs are fresh and modern and also interesting for advanced knitters. At the same time, less is often more, Jana's designs are never overloaded. The balance of demand and relaxation while knitting is always maintained. Martina Behm, born in '74, knits, because she likes to create something and loves to have wool in her hands. That has always been so, even in elementary school. Knitting has never been neglected, neither during her economics studies nor her time as a journalist. Martina designs preferably with colorful, hand-dyed yarns: "You can sit back when knitting, just plain knitting in garter stitch, and the result still looks great - because the dyer has already put as much love into it!" Martina wants to make her knitting patterns so that both, the knitting and the wearing is fun - as simple, relaxing and without purl stitches. Thus arose classics like the Hitchhiker, innovative shapes as in Nuvem, Viajante or Match & Move, and elegant as Heaven & Space or Rosen Bridge that effects hand-dyed yarn so wonderful. Martina Behm is a mother of two children and lives in an old inn on the edge of the beautiful Holstein Switzerland, where also courses and knitting gatherings are hold regularly. Melanie lives and knits in Bonn, where she shares with her husband, their three young children and with a lot of yarn a little house. In her designs, she breathes new life into the knitting scene - her creations are modern, casual, and especially wearable. Whether jeans or dress, jacket or skirt - a cloth as Drachenfels, Ashburn or Sunwalker always fits. Melanie loves to work with hand dyed wool. The vast quantity of beautiful colors as well as the subtle shades which give each model a touch of depth, make a knitting project equal much more interesting and exciting. She skillfully plays with the different tones and combines strong colors with neutral ones, to maintain a pleasing balance. Sue Grandfield (RiotousAssembly on Ravelry) is an English knitter living in Melbourne, Australia with her Tasmanian husband. Their work sees them travel the world, and knitting is the perfect companion on those long journeys! Sue’s love of travel means she can often be found knitting socks, shawls and accessories, small portable items that are great for knitting on the go, but there’s always a larger item on the needles too! Sue’s designs feature beautiful yarns in fabulous colours and are often inspired by her passion for photographing curious details from the world around her. She loves to research, explore and reinterpret traditional knitting techniques and her style features simplicity with a twist, attention to detail - sometimes elegant, sometimes riotous, but always fun to knit! Sue loves to teach and pass on her love of knitting. She has been presenting knitting workshops in Australia for the last 10 years and many of her patterns include photo tutorials so everyone is welcome and can share in the fun! Nicola Susen stands for clean lines and simple design - namely as a graphic designer as well as in her work as a knitwear designer. If you look closely, you can see even in her patterns her enthusiasm for the “Bauhaus” (school of design, not building supply store ;-). Her penchant for logic and mathematics following, Nicola began her career as a programmer. Arranging, optimizing and appropriate shaping was exactly what she wanted to do. Only her beloved strong colors missed out. By working as a graphic and knitting designer this deficiency was resolved. »Nicolor" is not only a name, but also program. Nicolors knitting instructions are under the sign "Maximum freedom": That means, jackets and sweaters in her program can be knitted with any yarn and in any size, some even without a knitting gauge. Comodo, Raglano, Hexagon, Hanne are just a few patterns which follow this principle of her instructions. Her clear and unobtrusive design goes not in competition with the color. On the contrary - both complement each other perfectly. This is also the opinion of those who knit these intructions. In Ravelry no yarn is so often used in Nicolors projects as Wollmeise in all variations. Asimina Saranti is a Computer Engineer and a Greek-Swiss. Being a restless spirit, she has developed over the years a passion for traveling, learning foreign languages, knitting & crochet, photography. This passion has led her to obtain first prize in a knitting design competition in 2013, publish knitting & crochet patterns, become a knitting and crochet teacher! It has given her the opportunity to learn, experiment and grow.